The KOD basketball team of 48 and 49 did a fine job of establishing Karlsfeld as a constant threat to any opposing team. Winning 15 straight games, and the League Championship, the team was expected to go to the top of the ladder. However, due to the tough competition, the team came out with 2nd place honors in the MMP Tournament playoffs. From here the team went to Eschwege for the EUCOM Ordnance Championship. They took 2nd place in the finals and received a plaque from Gen. MacMorland for their fine showing. The TC & I Division was organized in May 1949. Under the supervision of Lt.Col. Thomas, the group, consisting of 4 Officers and 15 Enlisted Men, has done a splendid job with the 2½ ton, 6x6 truck display, which has been one of the high points of interest for all visitors and personnel to see. The TC & I Division also sent a group of 2 Officers and 5 EM to Nurnberg with an exhibit of the various types of engines and motors that KOD produces. 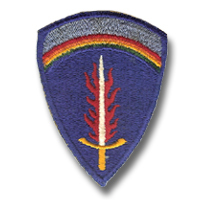 On the 25th of June 1949 the Headquarters and Headquarters Detachment, 80th Ordnance Battalion was activated consisting of 5 Officers, 1 Warrant Officer, and 18 EM from the 7840th Ordnance Depot Detachment. With station here at Karlsfeld the outfit has steadily increased it's efficiency in operating as a Hq. Company. July 1st found the Enlisted Men's Club at Karlsfeld beautifully decorated with much activity on the part of all concerned. This gala affair was to celebrate the 137th Anniversary of the Ordnance Department. Present at the party was Brig. General E. E. MacMorland, EUCOM Chief of Ordnance, Enlisted Men, Officers and Civilians of KOD, and their guests. Following a wonderful dinner, prepared by Mess Sgt. SFC Cecil Dixon, there was dancing, speeches and games. Music was provided by a fine Bavarian Band which played a march with everyone joining in. The march ended outside the Club where the games were started. The main event that climaxed the party was the tug-of-war. Between the Enlisted Men and the Officers and Civilians combined. The Enlisted Men emerged victorious, winning two times out of three. July 13th 1949, found 2 Officers and 27 Enlisted Men with their bags packed and loaded on Depot vehicles, They were headed for lllesheim, Germany, to setup an Automotive Assembly Line. This operation was to be part of the training in the "Secondary Mission" of the Depot Detachment. The operation lasted for one month, with a total of 47 Jeeps fully assembled and road tested. The Mission was carried out successfully, with the men completing the assembly of the vehicles in the allotted time. Capt. Jerome S. Sampere, Provost Marshal for KOD, received a trophy from Brig. Gen. E. E. MacMorland, EUCOM Chief of Ordnance, for Ordnance High Individual Pistol score. The handsome silver trophy bore the inscription: "Ordnance Division European Command for High Ordnance Pistol score 1949 EUCOM Small Arms Competition, Grafenwohr, Germany, Awarded to Captain Jerome S. Sampere". The football season started off with everything going in favor of the Munich Bronchos. One of our own men played an outstanding defensive game throughout the season. He is Cpl. Phillip Simcone, of the 7840th Ordnance Depot Detachment. "To you, Pbillip Simeone, we extend our hand in a gesture of thanks and appreciation for a ,job well done in the field of competitive sports". With the spirit you displayed on the field you have given a sample of the spirit of the men at Karlsfeld. On August 25, 1949, Sgt. Charlie W. Hammond of the Karlsfeld Ordnance Depot, received the Bronze Star for meritorious conduct in ground combat during the Battle of the Bulge in January 1945. Hammond, then Pfe, served in the 317th Infantry Regiment, 80th Division. Col. C. Elford Smith presented the decoration to Sgt. Hammond, while the Detachment was on Maneuvers near Eching. The KOD softball team of 49 showed great ability and sense of sportsmanship in the games that were played. Some of the scheduled games, however, were not played due to forfeitures by other teams. This was unfortunate do to the fact that KOD might have gone to the top of the ladder if they had been given a chance. The team ended the season with 10 wins and 2 losses, taking second place in the Sebree Softball League. The 80th Ordnance Battalion and the 7840th Ordnance Depot Detachment engaged in "Exercise Harvest". All phases of training were covered during the exercise and both units proved their efficiency as field units. 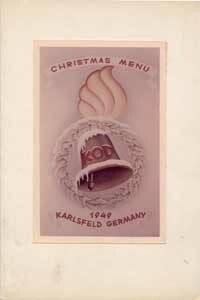 If you have more information on the history or organization of the Karlsfeld Ord Depot, please contact me . 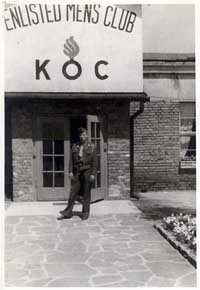 The Karlsfeld Ordnance Maintenance Depot (a.k.a. BMW Allach) will be released by the US Army and returned to its owners, the Bavarian Motor Works. BMW has been administering the large plant for the US Army under a requisition basis since 1945. The decision to return the depot to its German owners was based on the recognition that the future workload for ordnance requirements did not justify the operation of such a large depot and that the significant transportation costs involved in the operation of the depot makes it uneconomical. The Karlsfeld Ordnance Center is located at Munich in the Plant II of the Bayerische Motoren Werke (BMW). 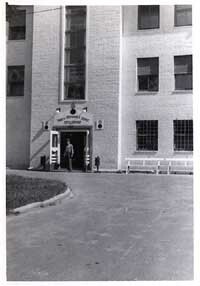 During World War II, this plant was used to assemble, test and rebuild aircraft engines. The plant is now operated by the Bayerische Motoren Werke under the control of Karlsfeld Ordnance Center personnel to rebuild automotive units for the United States Army. Company C, 601st Ord Bn recently moved from Karlsfeld to Germersheim. The company's mission is to process general purpose vehicles at the Germersheim Ord Vehicle Park. 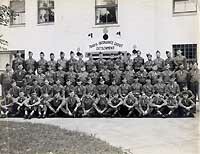 I am a former member of the 601st Ordnance Battalion stationed in Germany 1953 to 1955. Our main unit was stationed in Munich. My military job was rebuilding tank engines and I was one of a group who were assigned detached duty and were made up into Heavy Engine Rebuild Teams and traveled TDY throughout Germany. We rebuilt tank engines on the sites where the armored units were located. 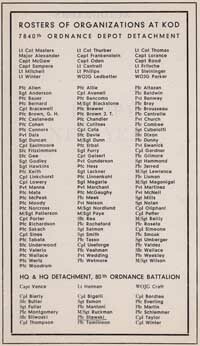 I beleave we (601st) were assigned to the 53rd Ordnance Group at that time. The battalion's primary mission is to provide fifth echelon repair on ordnance equipment ranging from tanks to padlocks.